28 Days of No-Cook AIP answers the FAQ "How can I follow a restricted diet if I have to travel?" For work, the holidays, or a big move, this e-book has you covered with nutritious, delicious meals that don't require a fully-loaded kitchen! One of the biggest challenges to actually putting the autoimmune protocol into practice is finding the time and energy to cook compliant meals every. single. day. You have to find recipes, make a plan, buy the ingredients, cook the food, and then clean up the kitchen afterwards. I can’t clean your kitchen for you, but I can get you started with the rest! 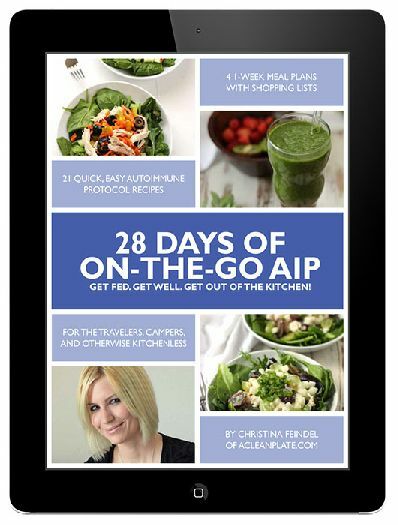 This e-book is the answer to one of the most frequently asked AIP questions, “What can I eat if I have to travel?”, and makes use of my favorite go-to recipes for holidays at my parents’ house, hotel stays, or any other circumstance in which the kitchen situation might be a little uncertain. My meal plans take the fuss out of finding recipes and utilize a wide variety of easy-to-find ingredients without requiring a lot of time or space in the kitchen. You can combine the plan with recipes you like or want to try from elsewhere, make double batches so that you have even more leftovers for easy meals down the road, and–best of all–spend less time in the kitchen so that you can get back out there and live your life.